As mentioned in Hindu Scriptures, flowers are symbolic manifestations of one’s spiritual and worldly ambitions in life. 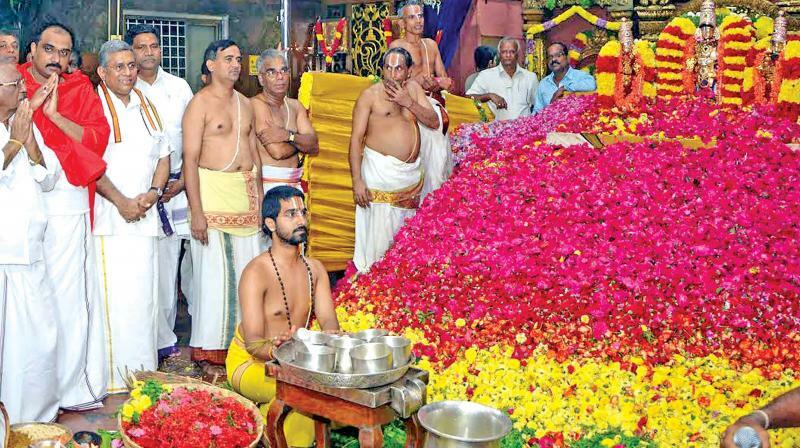 No Hindu worship is complete without offering flowers to the deities. Again, different deities have different favorites and their propitiation is incomplete without offering them their desired flowers. A particular flower is linked to a particular deity where the color of the flower also plays an important role. Flowers with mild smell are generally offered; strongly scented or scentless flowers are avoided. Fully blossomed flowers are only selected while mutilated flowers are done away with. 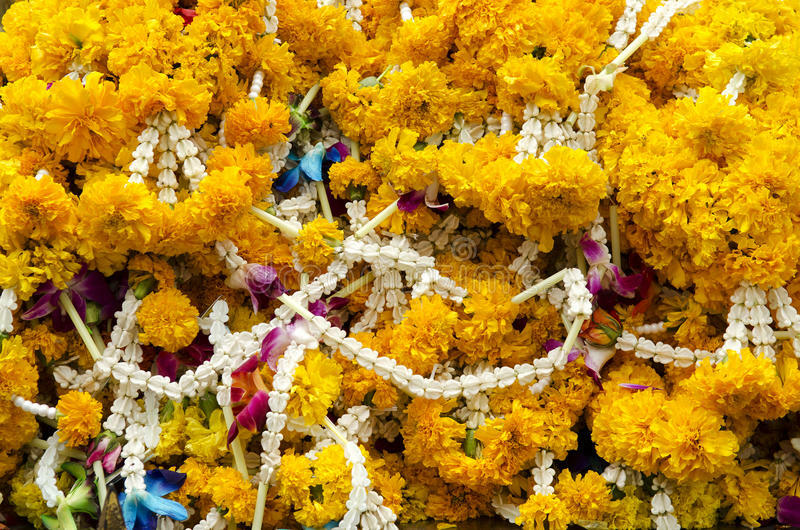 Forests and garden area flowers are considered best for the pujas. As mentioned in ancient scriptures, the flowers are also categorized into Sattva, Rajas and Tamas. Basically, they are distinguished on the basis of their fragrance, shape, color and origin. Sattva and Rajas flowers are for the daily offerings while Tamas flowers are meant for special festivals only. Rajas flowers – Trumpet flowers, White thorn apple flowers, Red lotus etc. Translated as – Flowers gladden the mind and confer prosperity. Hence, men of righteous deeds bestowed the name Sumanas on them. That man who is in a state of purity offers flowers to the deities finds that the deities become gratified with him, and as the consequence of such gratification bestow prosperity upon him. For Lord Shiva, the offering of China Roses is generally made. Lord Vishnu is always pleased with white colored flowers. The offering of Hibiscus or Jaba flowers is mandatorily made before goddess Kali and goddess Chamundi in the Shakti cult. In West Bengal, goddess Kali is adorned with 108 Jaba flowers garland around her neck during Kali Puja. All red colored flowers are favorites of Lord Ganesha. 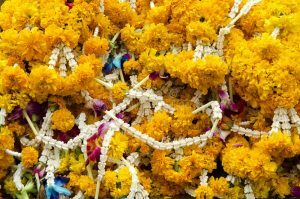 Though, yellow and orange marigold flowers are also offered to him. Lotus flower has been given a sacred position in Hindu mythology. It is believed that Lord Brahma, the Creator of this Universe, was born on the lotus which sprung from Lord Vishnu’s naval. Lotus flower is also used in Durga and Saraswati propitiation and the flower is also offered to Sun God. In the Hindu mythology, Kama Deva is symbolically presented as mango-blooms. 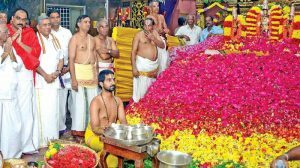 Planet Saturn is worshiped by the Hindus, mainly on Saturdays, to set off the karmas; Saturn worship is always done with blue flowers. Amongst the plant-leaves as offering to gods, it is well known that a Vishnu Puja is incomplete with offering him the sacred Tulsi (Sweet Basil) leaves and for Shiva Puja the offering of Bilva (Bael) leaves is must.